Standing in the middle of Koreana Plaza, the big, bustling food emporium I’m supposed to be researching for an Oakland Magazine article on Ethnic Markets (Nov. 2011 issue), I feel overwhelmed by the vast display of sauces, snacks, produce and prepared foods. I don’t even know where to start. Then it hits me. I can’t remember ever eating Korean food. Oops. As a food writer, I am embarrassed to admit this large gap in my restaurant resume. While I have relished countless Japanese, Vietnamese, Cambodian, Chinese, Thai and Burmese dishes, I seem not to have found my way to a Korean meal. 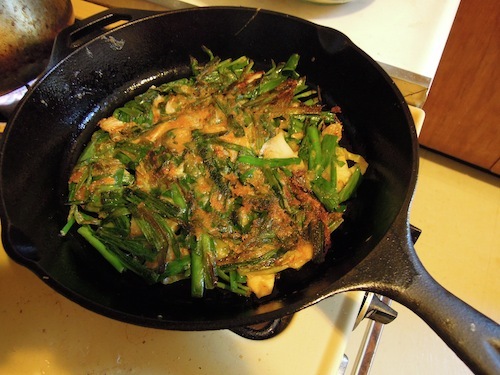 Being an adventurous eater, however, I am eager to cross the border into Korean cookery and begin a (local) expedition of this complex cuisine with ancient roots. Happily, I can rely on some fellow food bloggers and gracious contacts to fill in a few of the blanks (and help me start sampling the food). Serene Vannoy, the intrepid cook who blogs at www.momfoodproject.com and loves trying new things at Koreana Plaza, tells me to try the roasted corn tea, tteok (rice cakes), live crabs, Asian produce (like lotus root, galangal, mangosteen, durian, rambutan) and the assorted kimchi (the fiery national dish of fermented vegetables). Here’s her recipe for kimchi soup. On another lucky day, I meet up with fellow food blogger Ben Rhau, who writes the award-winning www.youfedababychili.com. This San Franciscan is on his first visit to Koreana Plaza where he shows me some distinctive Korean ingredients that his mom often cooks with (and now, so does he): Korean pears, fern bracken, Korean chives, sesame leaves, soybean sprouts and a myriad of laver (seaweed). Here’s a lovely piece Ben wrote about his comforting food heritage. 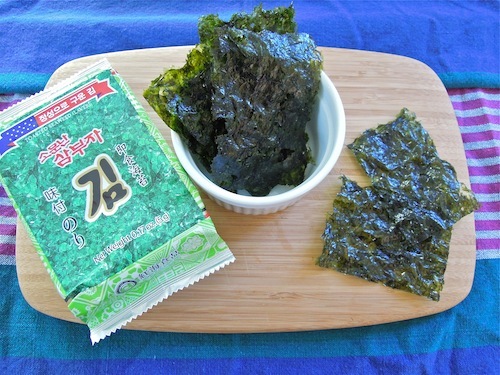 Thanks to Ben and Koreana I discover a new best friend: single serve packs of seasoned seaweed. The feather-light sheets float like crispy, toasted tissue paper onto my tongue, simultaneously satisfying my urges for something green, crunchy and salty. At the end of our tour, Mr. Yu kindly presents me with bulgogi-filled “Korean sushi” (aka kimbap) and some kabocha squash flavored tteok. I greedily gobble them in the car driving home, barely forcing myself to stop so that my husband can get a taste too. 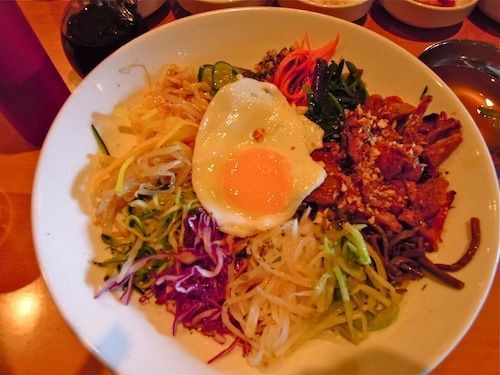 On a roll, I announce to him that we are going to dine at the nearby, newish Korean restaurant, Bowl’d on Solano. At Bowl’d (double meaning: bold and many dishes served in bowls) we plunge into a menu of as-yet-untried pleasures. I order “The Works” featuring a mandala of vegetables plus egg served over wild sweet rice, brown rice, barley and red rice. My husband—with a little prodding from me—chooses barbecued beef, served with steamed cabbage leaves to wrap up every moist morsel. 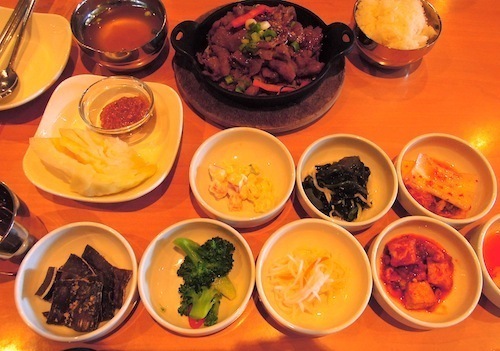 Dinners come with banchan, the traditional variety of little side dishes, some spicy, some cooling, some crunchy, some comforting. So many new tastes and textures; a gustatory voyage of discovery. 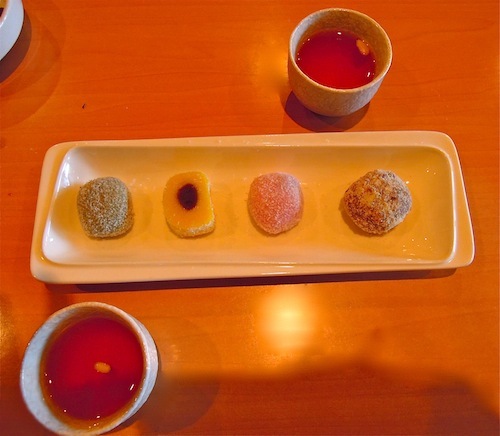 Dessert is a quartet of petite sweet rice cakes filled with nuts or red bean paste, served with a delightful cup of warm cinnamon tea (made with dried persimmon and ginger). I can’t wait to return and try the rest of the menu. The group generously allows me to come over, pepper them with questions and take pictures while they chop, mix and stir-fry at one of their monthly cooking get-togethers. They also invite me to share their food and ply me with makgeolli, a potent, milky rice wine. 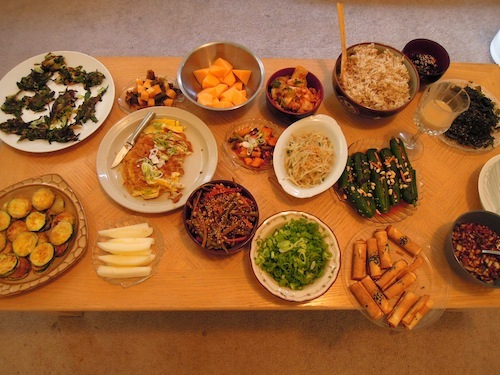 With apparent effortlessness, the women whip up a dizzying array of dishes including stir-fried carrot and burdock root, chive pancake, stuffed cucumbers, marinated bean sprouts, fried zucchini, omelet, and noodles, all while warmly chatting. 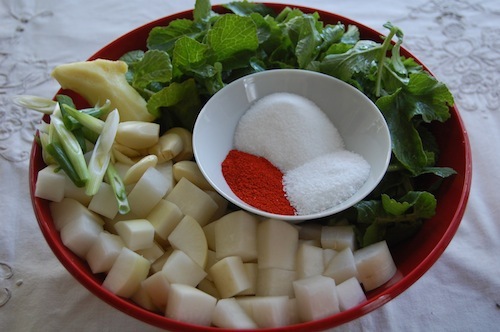 They cover the low dining table with additional dishes of radish kimchi (recipe below), melon slices, seaweed ribbons, rolled cookies and assorted nibbles. I feel overwhelmed again, but this time by the multitude of flavors in Korean cuisine that I have just begun to explore and also by the warmth and generosity of everyone who has helped me begin what I’m sure will be a long journey of appreciation. 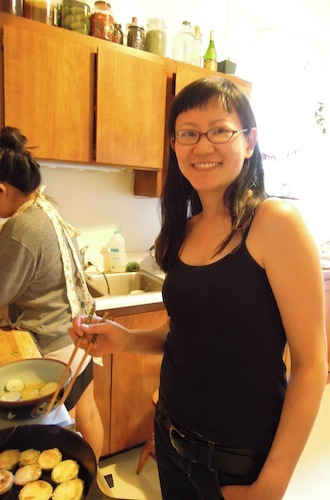 April Kim is a second generation Korean American who learned to love food in her mother’s kitchen. She is very active in San Francisco’s Asian Culinary Forum. 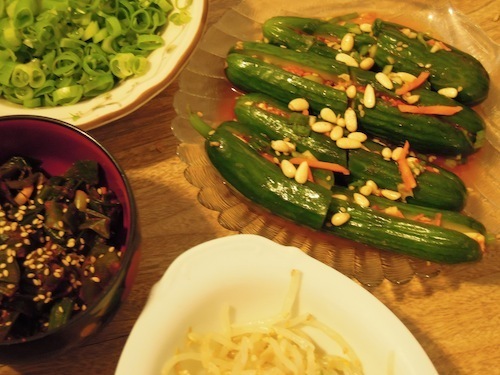 This recipe is for one of her favorite kimchis and is said by some to be the best way to measure the quality of a Korean restaurant. 1 1/2 lb Korean radish*, chopped into 1-inch cubes. 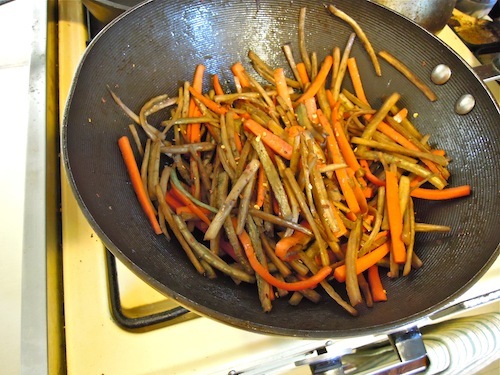 You can also chop and add green stems as well. 5 scallions, ends trimmed. Cut both white and green parts into 1 inch lengths. Toss all ingredients together a large glass bowl and transfer to glass jars. Rinse out the mixing bowl with a splash of water and pour the rinse water into the jars too. The radish cubes don’t have to be submerged but the jars should have some liquid, more will “weep” out of the cubes as they ferment and the salt settles into the cubes. 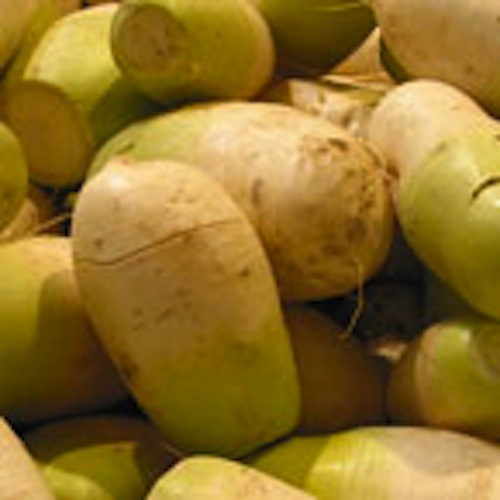 Close jars tightly and allow to sit at room temperature 1-3 days, when they will be ready to eat. 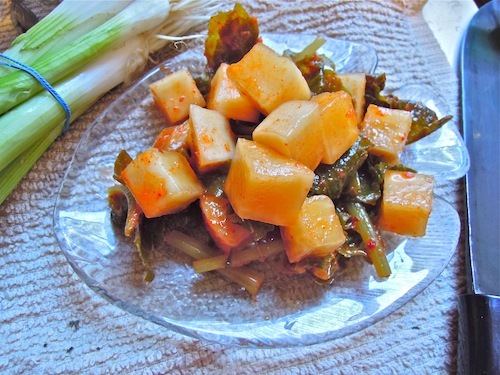 This entry was posted in Korean food and tagged banchan, Ben Rhau, BJ Yu, Bowl'd, ethnic markets, kimchi, Korean cuisine, Koreana Plaza, Oakland Magazine, recipe Radish kimchi, Serene Vannoy. Bookmark the permalink. When I used to live in Sacramento and Sam lived in SF, I would drive down late Friday evenings after work and we would go for Korean BBQ at one of the several restaurants out in the Clement/Geary area of the Richmond. There would be lots of young Korean couples out on dates there at 10 pm! These days we go to Ohgane, on Broadway — very good! I love all the little condiment dishes that come with the BBQ, as well as the grill-it-yourself-at-your-table experience. Now thanas to your blog, I know what the little dishes are called. FYI — the single serve packs of crisp seaweed are available at Trader Joe’s!